A team of journalism students is developing a prototype for an interactive newsgame after winning funding in a City entrepreneurship competition. WordPlay will allow users to engage with audio content such as podcasts through screenless devices. And the four students say their product will be the first of its type in the world. 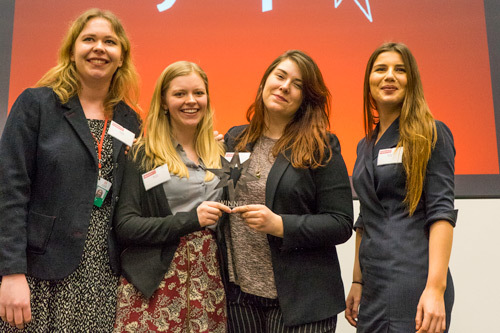 The team – Cambria Bailey-Jones, Eleanor Smallwood, Gabriela Jones and Georgina Righton – are all studying MA Broadcast Journalism and won £5,000 in the university’s 2017 CitySpark competition. Cambria and Gabriela will lead the development of the prototype after they complete their degree courses in June, and they have already enrolled at a summer school run by the university’s incubation space, City Launch Lab. The team hope to have created their prototype by mid-autumn, when the plan to pitch the idea to news organisations, such as the BBC, New York Times and Buzzfeed, who they say have already invested in visual games. Cambria explained the four students came up with the concept while working on a project on the Journalism Innovation module, run by Professor Jane Singer. Before studying at City, Cambria was working for a small independent documentary company called Maya Vision International making history programmes for the BBC and PBS in America. Gabriela was working as a multimedia producer, overseeing videos for The School of Life’s YouTube channel and working on a feature documentary for BBC Radio 1. Ellie was teaching and studying in China, and Georgina was studying an undergraduate course in languages. The team says they developed the idea after discussing the popularity of digital games, the potential for incorporating news in them and the development of “smart speakers” by Amazon, Google and Apple. “I’m a huge podcast fan and knew from the start I wanted to pursue something in audio,” said Gabriela. “It wasn’t until we started talking about the gamification of news that it struck me – all the games out there right now are visual.